Most people don’t know firewood that’s chopped down from a tree usually retains about 50% water. This causes a lot of problems when trying to use it in your fireplace. Instead, individuals need to season the firewood so it dries out and moisture escapes the premise. At the end of the day, wood burns better and cleaner when it’s dried. Under 20% of water in the wood is prime burning conditions for any fire. However, a lot of people just think they can burn anything in a fire to keep the flames going. This could not be further from the truth. 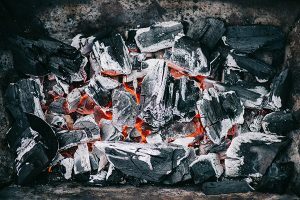 Wood that’s not appropriately seasoned will cause a build-up of creosote in a chimney or lining. Creosote build-up can be very dangerous because a fire could start and consume a room or an entire home. So, knowing how to properly season firewood is a must when using a wood-burning fireplace indoors. Before anyone starts drying wood, you must make sure to understand the properties of wood. Seasoning differs depending on the type of wood. The sap quality in a tree tells a lot of the story. In the winter, sap moves down to the roots; in turn, this allows for trees to lessen moisture throughout. For example, pine trees take anywhere from half a year to a full year for its wood to season properly. On the other hand, hardwood trees like oak and orange trees need 1 to 2 years of seasoning time. Water on the surface is not the issue with seasoning; it’s the moisture inside the wood that takes the longest to season. Air drying woods like cherry and hickory will not help lessen the content of moisture. Woods like cottonwood and sycamore are greatly benefited from leaving outside to air dry. Understand that wood can be over-seasoned causing the wood to burn less effectively. There are test meters that give a moisture reading for any type of wood. The best time to search for firewood is in the summer. This is the time when you can use the hot weather to your advantage to help season it. Storing wood outdoors can be very helpful if there’s little to no rainfall. If the possible storage area is too wet to leave the wood, try placing in a dry indoor facility. Heaters can also be placed in a storage room to help relieve the water content. Just be sure that you store it in a dirt room instead of inside a home because termites and other creatures love the shelter that this kind of wood provides. The last point might be common sense to most, but issues like this happen all too often. Countless people go out to chop down a tree to be seasoned, find one they like, and start chopping. What they don’t consider is the type of tree they’re cutting down. Unfortunately, a lot of endangered trees are chopped down every year because people don’t think before they act or they have no understanding of the decline of native trees in the area. Either way, do your homework before going out to chop because it could cost you a hefty fine if the authorities find out. When narrowing your wood down to size, make sure that you cut your pieces no smaller than 6 inches and no bigger than 18 inches. 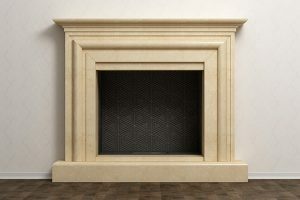 This will help when fitting wood inside a stove or fireplace. To cut wood, decide on either an axe that is finely sharpened or a chainsaw. Be aware and alert to protect yourself during this step for it can be very dangerous. If you have any rotten wood, don’t cut it up and pile it to be seasoned. Just throw this wood out; it’ll be no use to you because it won’t be worth the little heat that it might put out during burning. As wood is stacked, use stapling bases to keep your wood off the ground. Also, pallet wood can be used as an alternative. Side supports can be added to this pile to prevent the wood from falling all together. Another ingenious method is to stack the ends of the wood at a 90-degree angle for each layer to make your pile support itself. 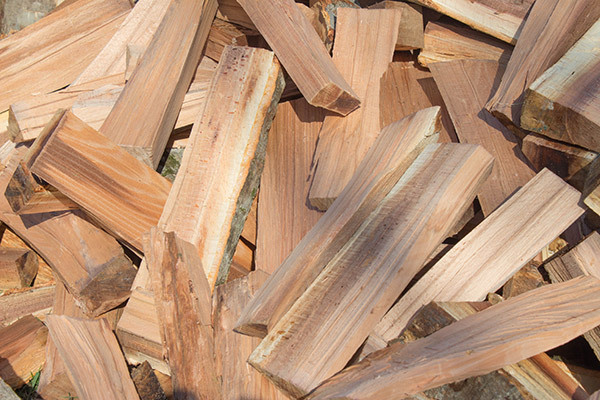 Seasoning wood is only effective when air is able to move around and through the wood pile. The wood will dry a lot quicker when air is allowed into the process. You can use a tarp or sheet underneath the wood to act as a barrier against moisture. Another way to help season your wood through air circulation is to keep the wood off the ground so air flow can get under the stack. If you choose to use this method, protect against termites and carpenter ants by treating the area. Lastly, keep the wood away from any wall, so air can move unimpeded. A good rule of thumb is keep your wood 20 feet away or further from any structure. Just because air flow is needed to help season your wood doesn’t mean that you should leave your wood pile out in the cold. When it comes to the elements, rain and snow can be detrimental to your seasoning. Instead, rain and snow can be directed off your wood with a tarp. Still leave the ends of your wood pieces uncovered, so air can help do the job right. If you still have bark on your wood, you have two options when protecting it from rain and snow. To use the bark to your advantage, stack the wood with the bark facing up. This will help keep rain from seeping into your pile. The other option is to place the barked side facing downward into your pile. This will help in the seasoning process, but you’ll need to make sure to tarp the pile when inclement weather comes. As stated, there are two options that can be used when weather and seasoning collide. 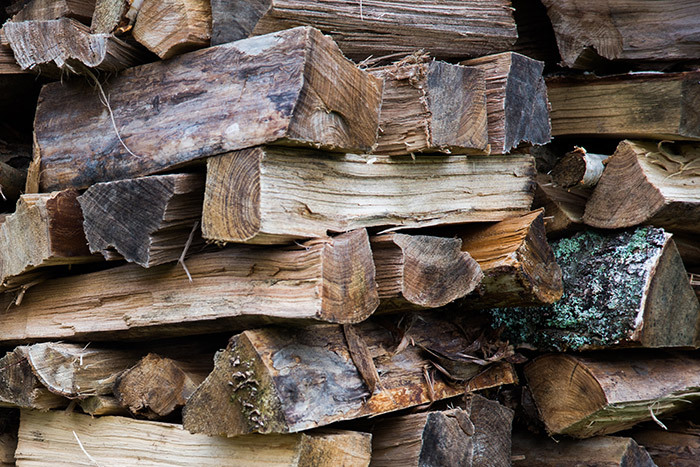 Some firewood connoisseurs believe that even if the wood is soaked, it’s part of the natural seasoning process. Sure, your firewood may take longer, but it’ll be all-natural. Many people wonder when the seasoned wood will be done. There are a few ways to check if your wood is ready to be used. First, grab two pieces of your newly seasoned wood and bang them together. Notice if the wood sounds like it’s “ringing” instead of a “banging” sound. Also, put your wood in the fire. Does it burn in 15 minutes or less? If so, your wood is ready to burn. Lastly, look for cracks in the wood. This helps show that moisture is no longer inside the wood and it’s starting to crack from the dryness. Depending on how you season your wood will definitely make the process your own. Be patient and enjoy the progression because, in the end, you will have a seasoned wood that’s different and specific to you. Happy seasoning! 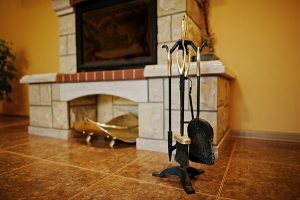 Remember, before you start using your fireplace each year, it’s highly recommended to get an inspection and a chimney cleaning to ensure your safety. Homeowners in the Chicagoland have trusted Early Times for over 30 years for all their chimney needs. 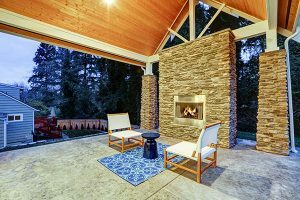 Get a free quote today for any of our chimney and fireplace services.